A polish and wax � in one! Marine 31 All-In-One Gel Coat Polish & Wax is the ideal one-step solution for removing light oxidation and staining on gel coat � standard and painted. Formulated using advanced micro-abrasives, propriety cleaning agents and nourishing oils, Marine 31 All-In-One Gel Coat Polish & Wax maximizes color and gloss while leaving a durable layer of wax protection. This zero-dusting formula is incredibly easy to apply by hand or machine. Say goodbye to multiple steps and say hello to Marine 31 All-In-One Gel Coat Polish & Wax! In one simple step, Marine 31 All-In-One Gel Coat Polish & Wax removes oxidation and staining while leaving a glossy, durable layer of wax protection. Marine 31 All-In-One Gel Coat Polish & Wax will enable you to spend less time polishing and waxing and more time being out on the open water. Gel coats oxidize, and there�s no way around that. Exposure to UV rays from the sun and salt from the ocean cause gel coat to fade and discolor over time, taking away from the overall appearance of your boat. Waxing isn�t enough! By utilizing micro-abrasives and nourishing oils, Marine 31 All-In-One Gel Coat Polish & Wax deep cleans and hydrates the surface, maximizing gloss and smoothness as it leaves a durable layer of wax protection. 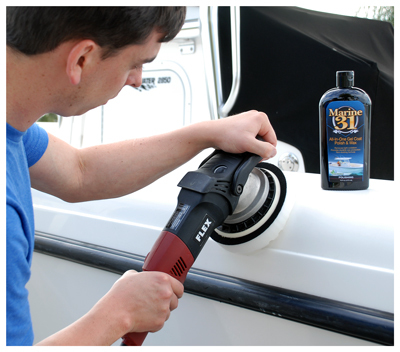 Marine 31 All-In-One Gel Coat Polish & Wax is far more than a traditional boat cleaner wax. Marine 31 All-In-One Gel Coat Polish & Wax is formulated using the most effective UVA and UVB absorbers available in for a marine care product. This provides superb protection against the elements so your boat retains that just-waxed shine month after month. Marine 31 All-In-One Gel Coat Polish & Wax is harbor safe and eco-friendly. Apply an �X� of product directly onto polishing foam pad on a dual-action polisher and spread product over a 2� by 2� area. Set polisher to medium speed setting and work product until it turns clear. Remove residue with a microfiber towel.